Interested in Home Groups? 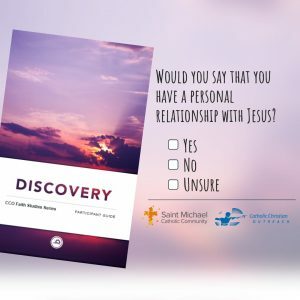 Journeying through the Discovery faith study gives you the opportunity to grow in relationship with Christ, and will also serve as a precursor prior to launching into Home Groups here at St. Michael’s. Join us on Wednesday evenings at 7 p.m. beginning Jan. 16, 2019. Cost: $10 for the participant’s guide.